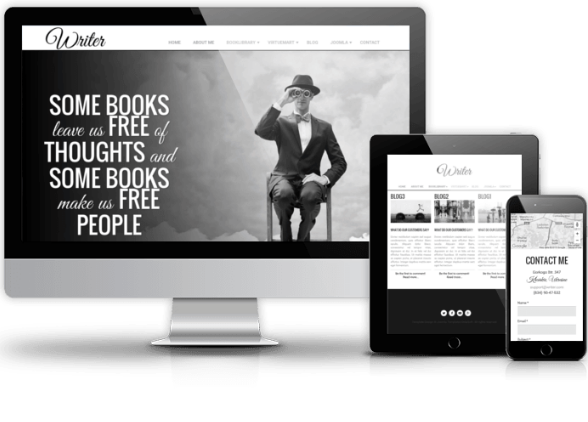 Writer is unique and creative portfolio Joomla template with ability of creation full-featured online private or public library website. Carefully designed web pages allow setting up a superb portfolio website with built-in online library. The creative Joomla template includes tons of features for showcasing photos and images, creative works and books. It is particularly suitable for creatives, writers and portfolio websites. Also this portfolio template with online library can be used for universities, colleges, schools and other educational websites. Writer Joomla template is fully responsive and cross browser compatible (with mobile devices also). Spectacular full-screen slideshow with swipe effect and eloquent phrase doesn't leave anybody indifferent. Also Writer portfolio Joomla template comes with a variety of additional stunning pages like as Contact us with working contact form, About us with counters of some figures from writer's life, important dates and responsive Joomla gallery with classy effects while hovering. Book Library Joomla extension. was added to package of the template for creation online library. Using the astonishing Joomla solution for management online library - Book Library, it's easy to manage books from admin area and frontend, fetch books from Amazon, manage authors and much more. You can find following pages made with help of Joomla Book Library component: All Authors (default and photo layouts), All Categories, All Books (default and list layouts), My Books, Single Book and more. You can create you own webshop or eCommerce website using Writer Joomla template, because Virtuemart is also included in package. For maintaining a blog we added OS CCK blog and designed three-column blog page. Get this responsive portfolio theme with stunning features for online library as a single template or join our Standard club to get all Joomla templates at once.